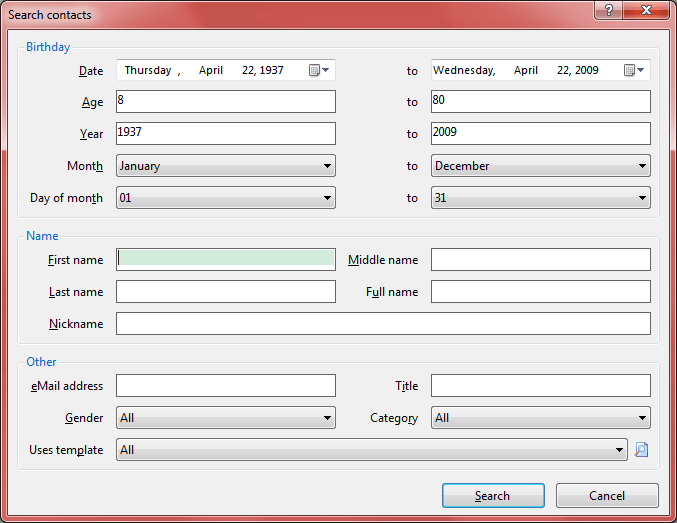 Click <Search> button on the Contacts manager interface. - views the selected email template (except 'All'). <Search> - finds Contacts according to the specified conditions, the result will be shown under 'Search Results' node on the Contacts manager interface <Enter>. 1. Uses fuzzy search, for instance: fill [Full name] with 'ack' maybe will find 'Back', 'Jack'. 2. All fields are NOT case sensitive. <Cancel> - closes this dialog box <Esc>.